YourWelcome’s CEO Henry Bennett joined Chris Poulter for an interview with The Serviced Accommodation Podcast. Listen to Henry talk about how he got into the short stay industry, and find out more about YourWelcome & the benefits of using our tablets. 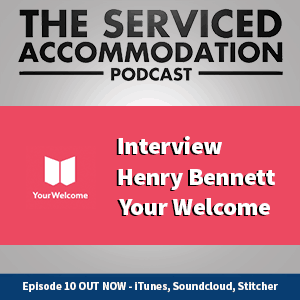 Episode 10 of The Serviced Accommodation Podcast featured YourWelcome CEO Henry Bennett to discuss how the company was founded and what the future holds. Before starting the company, Henry put his own house on Airbnb and discovered that little mishaps and confusion from the guests led to him being asked a large number of questions. This then gave him the idea to record a series of videos on a tablet that he left out for them to use, answering the repetitive questions asked by his Airbnb guests. It was these video’s that sparked the idea for the tablets, thus the beginning of YourWelcome.